I’ve been asked all year if we are planning another trip to Goblin Valley this summer. Remembering last year’s experience, my answers were always vague and uncertain as I was contemplating the possibility of another option. 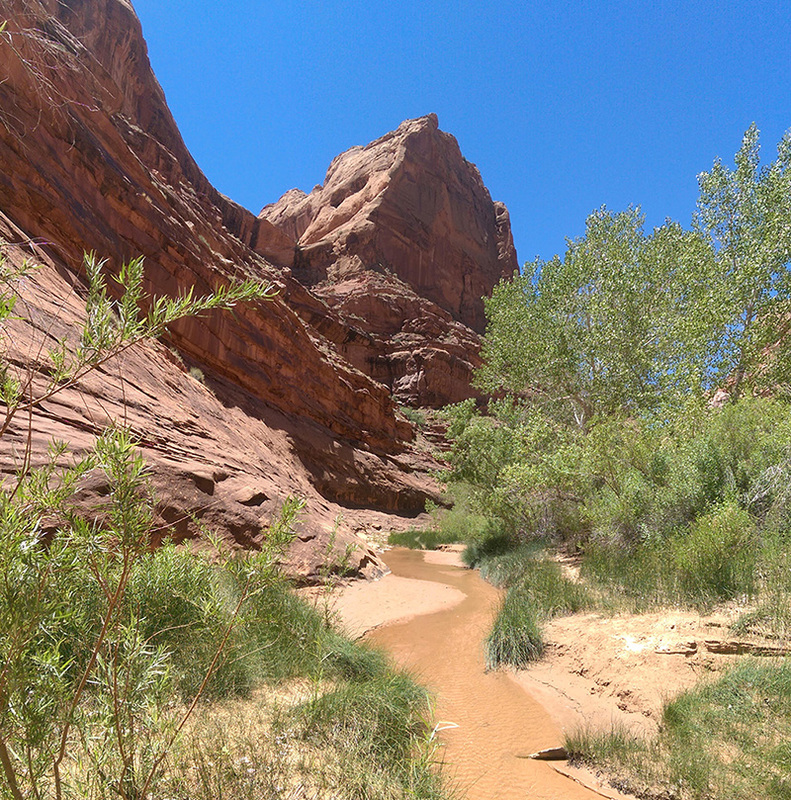 I really liked having more time to experience those San Rafael slot canyons with the added night to our stay, but not so fond of being responsible for our troop’s safety while we exerted ourselves in those kind of temperatures. 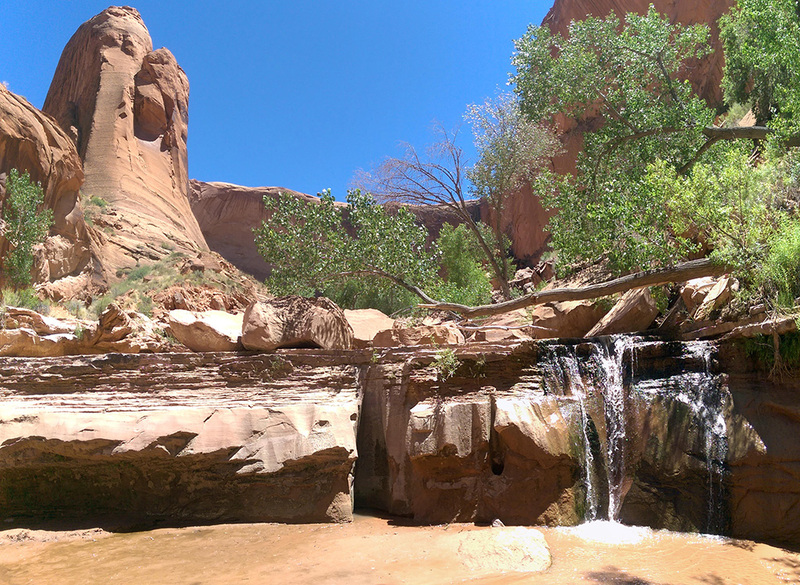 What I really wanted was to find an alternative that was just as interesting as Goblin Valley but with access to water, anything from a pool to a trickle would suffice. 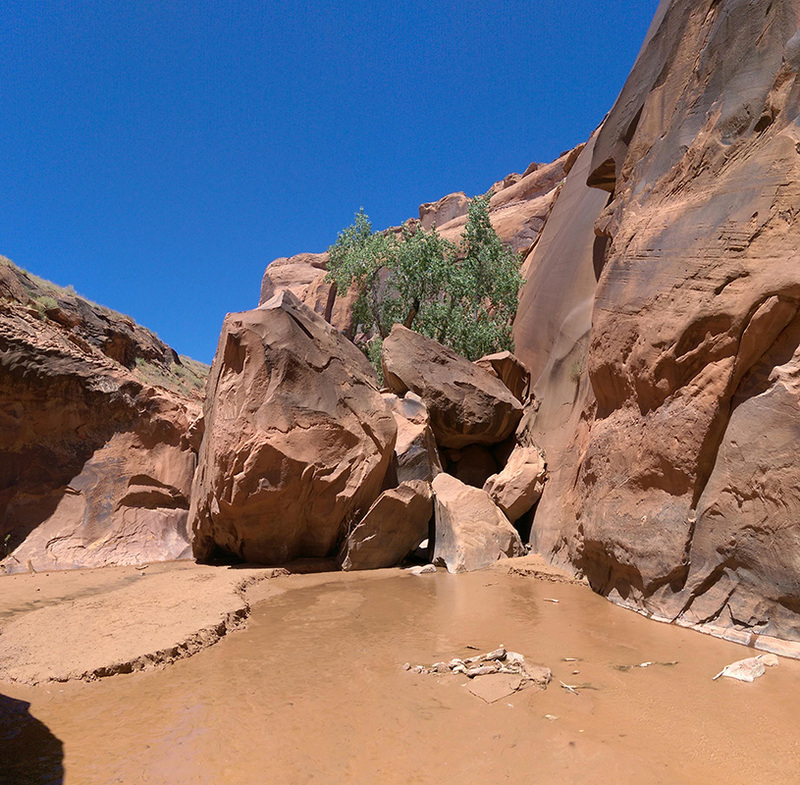 Well, my ASM found it… Coyote Gulch! Over the winter, I had heard him planning a trip to this location with his sons in March but it fell through and they ended up not going. 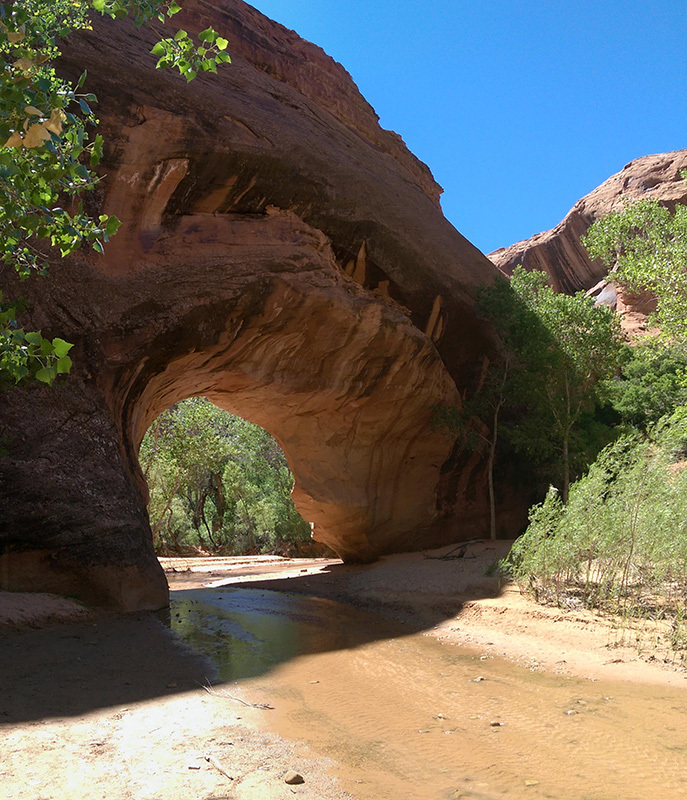 As spring rolled on and disappointment continued for him, we slowly saw the door open for this to be the perfect place to try another June 2-nighter with scouts in southern Utah! 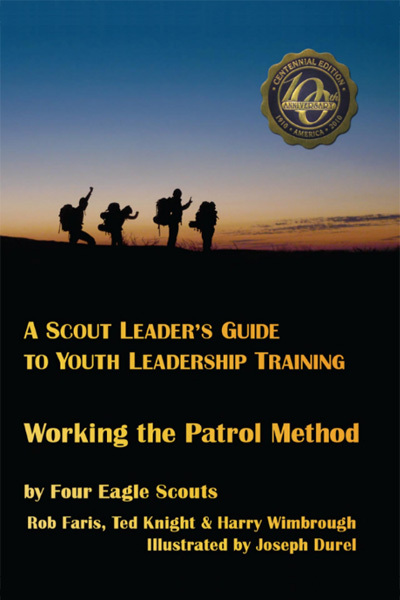 The more I read blog posts and trip reports of others (especially those from fellow Scoutmasters who took their scouts – thanks Shane Wallace, I wish AllTrails gave me a way to contact you! ), I knew we could do it and would be a great alternative to what we’ve done in the past… especially since it involved walking through a wet watercourse! 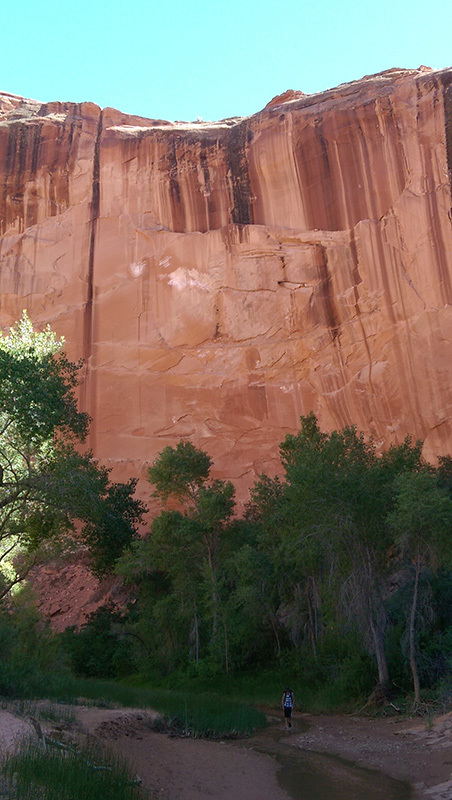 Nether myself nor my ASM had ever visited the Escalante area before. So our plan was to drive down on Thursday, find a place to camp, set up, eat dinner and get a good night sleep for Friday. Expectations had already been set that Friday was the big day. The boys knew we’d be hiking 10+ miles and that it would take all day. 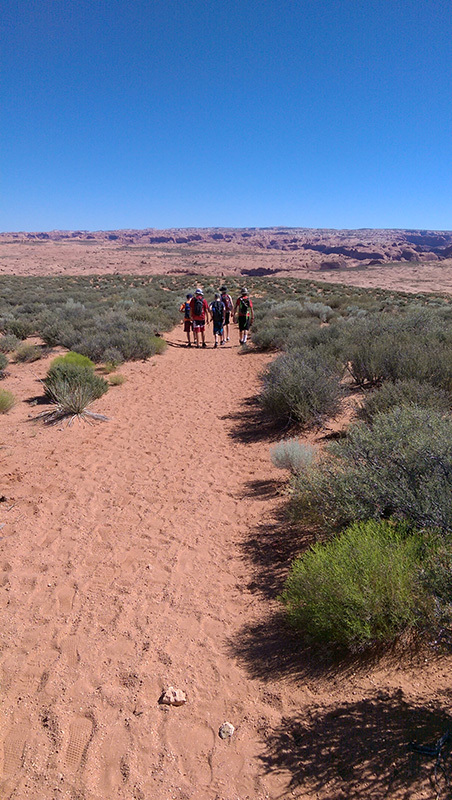 We told them that our pace would be relaxed enough to enjoy the scenery, that we would stop and rest whenever they wanted and that it would be well worth it and fun if everyone was well prepared. 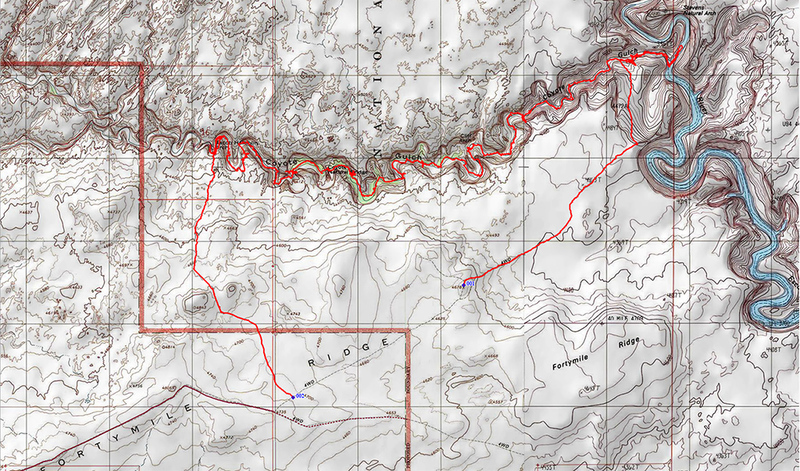 The route we chose was to park at the Fortymile Ridge trailhead and hike down through the Crack in the Wall. 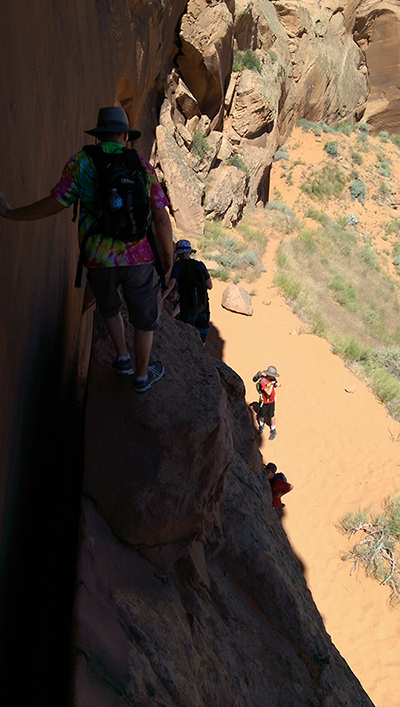 This was fun for everyone as the boys couldn’t believe they had to squeeze through this crack to make our way down…but all made it with ease. 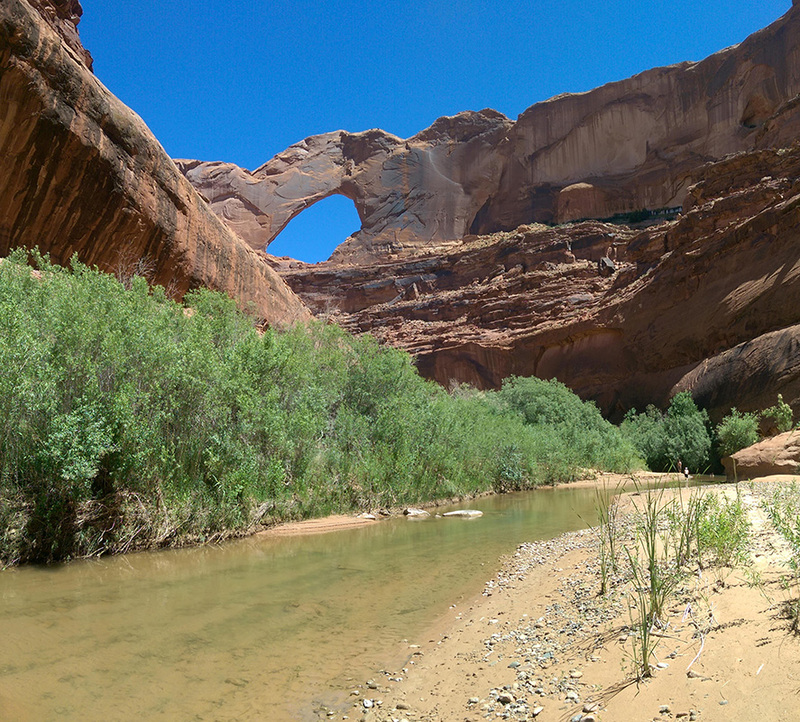 Once we got into the gulch, we headed downstream to the confluence and up the Escalante River to get a closer view of Steven’s Arch. 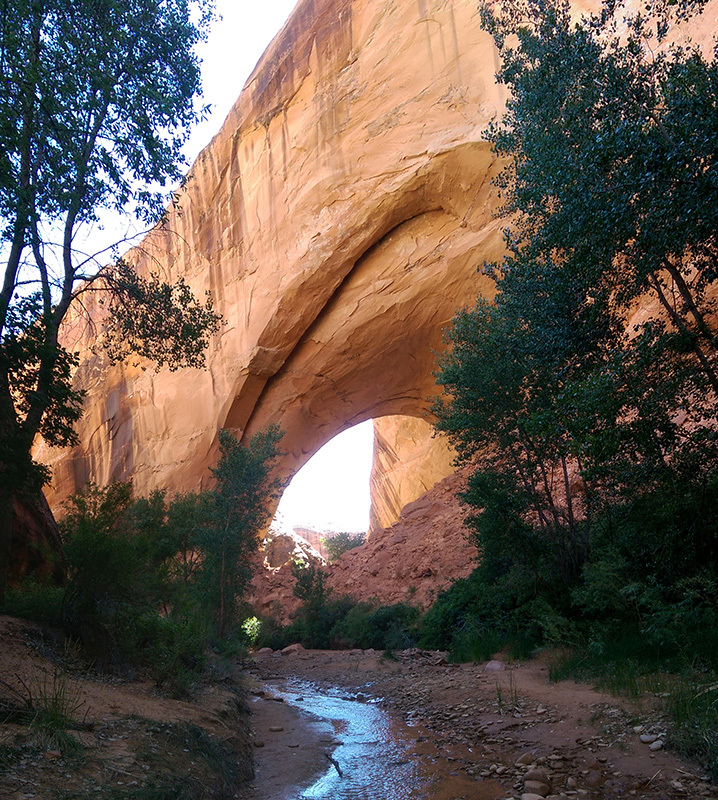 We only spent a few minutes there to snap some pics before we turned around to travel towards our ultimate destination, Jacob Hamblin Arch. We saw so much natural beauty along the way. 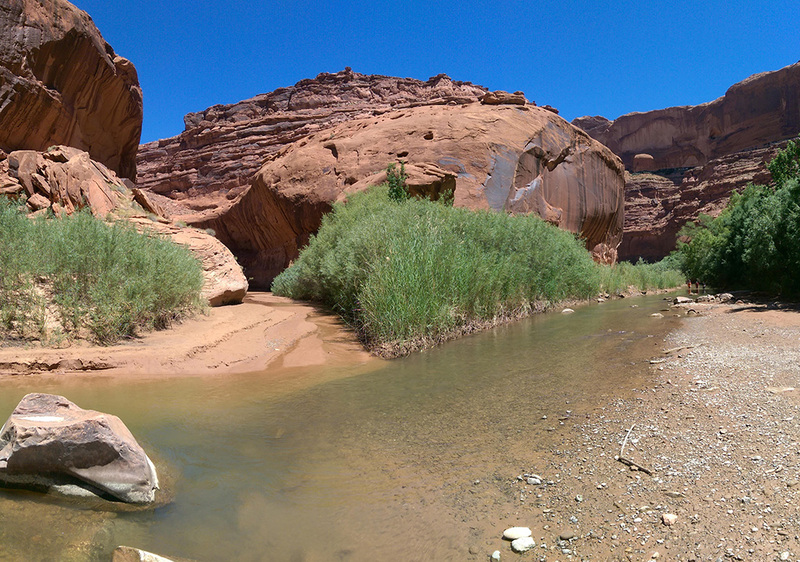 It was incredible, like a different world existed down there compared to what lives on the barren desert floor above. 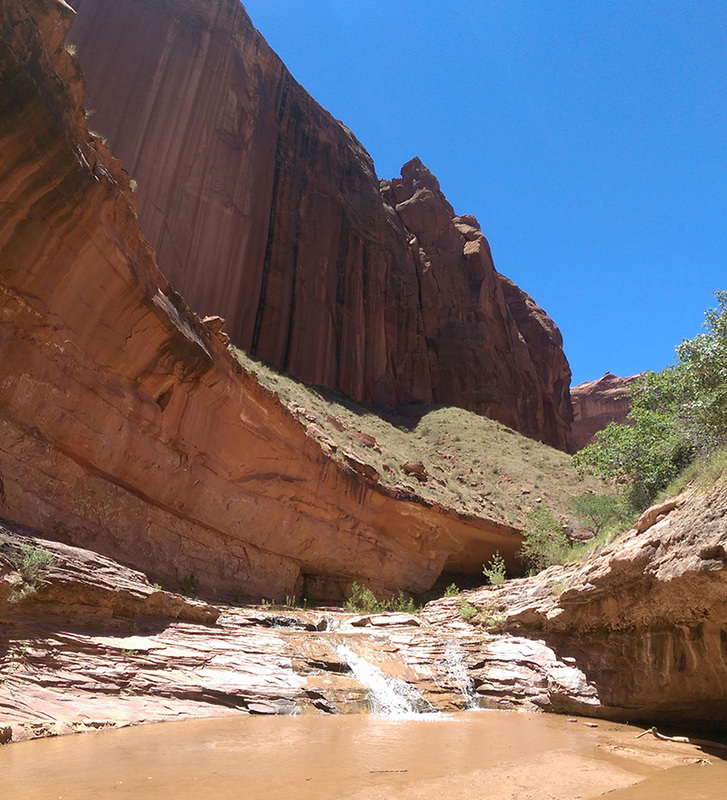 We passed 6 waterfalls, 2 seeps, a natural bridge, arches, tall cliff walls and gigantic alcoves…all through ankle-deep water that was probably 75 degrees warm. 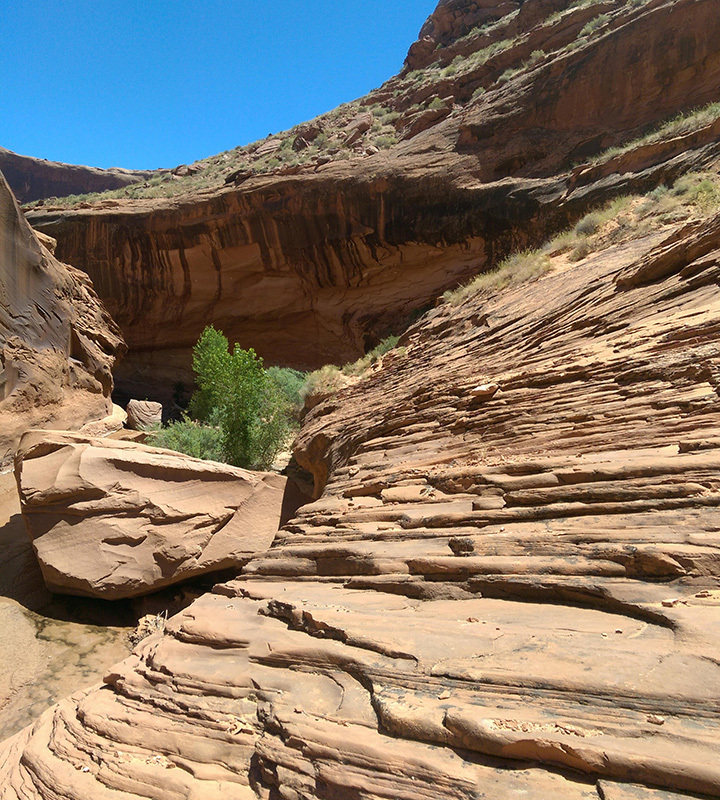 I’d have to say this was one of the most beautiful canyons I’ve ever been in, and my personal list includes Subway, Orderville, The Narrows (from Chamberlain’s) and Buckskin Gulch. The variety was amazing. Everyone also did great! We calculated about 11 miles in 8.5 hours with not a single incident or injury to deal with. The hardest part was only at the end. 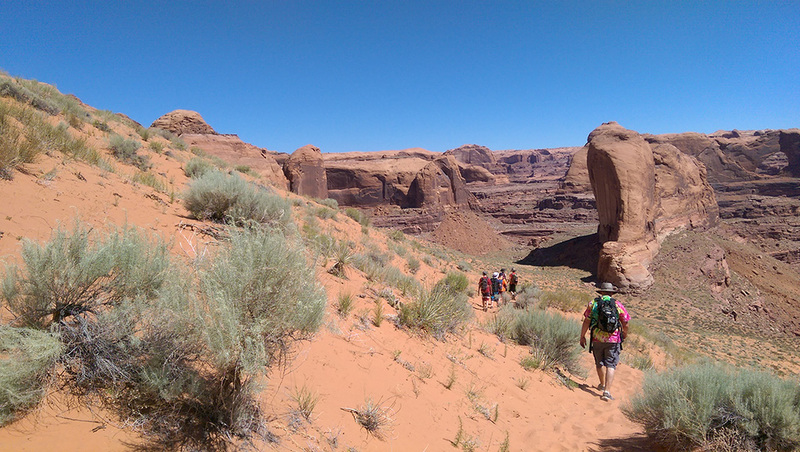 That last mile and a half across the desert back to the car was tough for them after hiking all day, then climbing up the steep ascent from Jacob Hamblin Arch, with feet and legs tired and some added heat from the desert level. But they did it, and felt good about doing something hard (not that night, but the next morning). 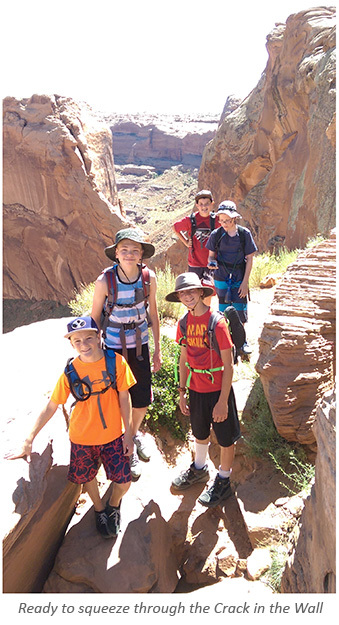 Doing Coyote Gulch as a day hike was perfect for these 12-13 year old scouts. I couldn’t see my first-year boys lugging a full pack along the route we took. In fact, I’m thinking about a strategy for my Ward’s scouting program to build up anticipation for this destination by giving each age group something to look forward to. 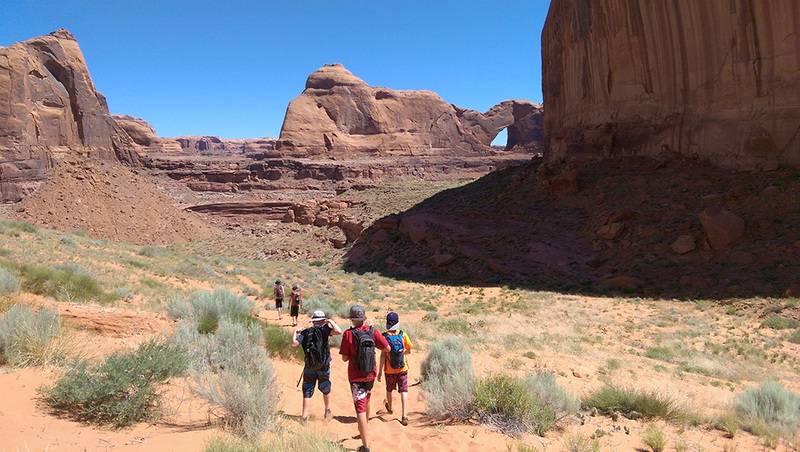 In other words, do Coyote just like we did with this younger age group and save the multi-night experience as a High Adventure trip that could be extended further through either Hurricane or Red Well Wash. 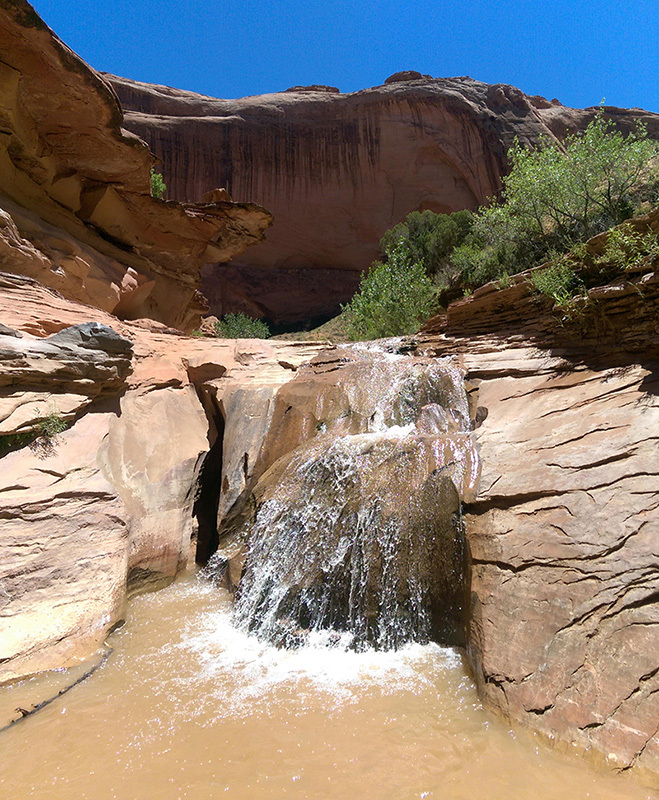 In either case, Coyote Gulch is a great place to satisfy requirements for the Hiking merit badge as just we did with this “10-miler”. 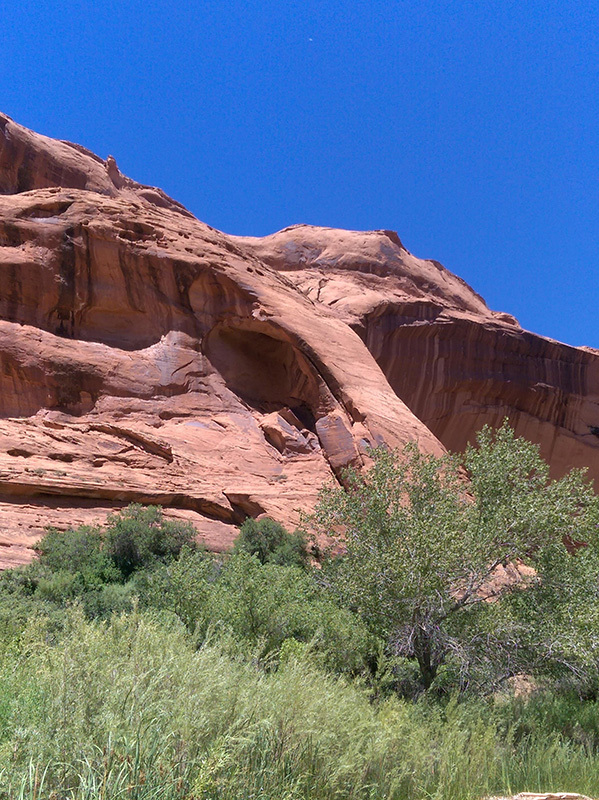 Other things to keep in mind as you visit Coyote Gulch. A permit is not needed to visit this area unless you are staying overnight…and even in that case, it’s FREE! It was great to not have to play the Utah Overcrowded Recreation Game and not worry about applying for a permit 3 months in advance. I brought a filter to resupply water but didn’t need it. I’ve read other accounts of murky water, but both sources were crystal clear for us if we needed to pump for more. If we do this again next year, we may talk about modifying our exit strategy. 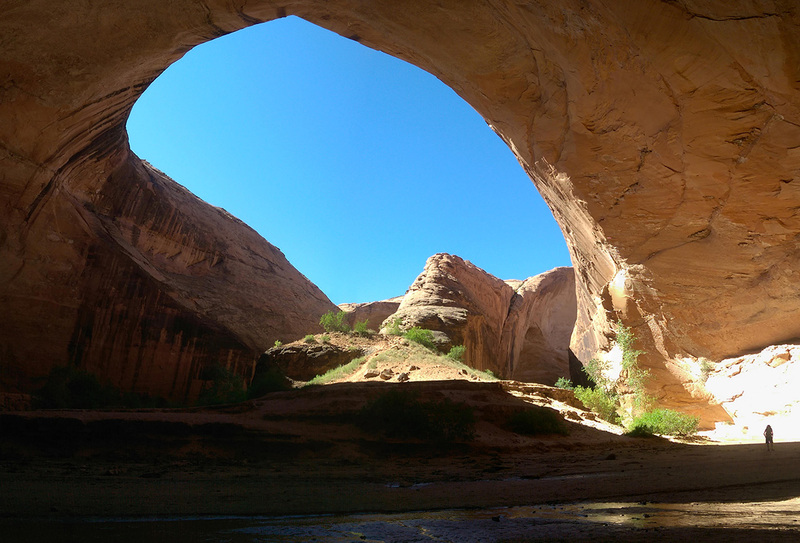 In other words, instead of coming up out of the gulch and then picking our way east across the desert back to the car at the Fortymile Ridge TH, I think I’d rather park a vehicle at the Jacob Hambin TH (water tanks) since that’s pretty much a straight shot from the Hamblin Arch climb. This idea would require one of two options: a) shuttle boys between parking spots to cut down that 2-mile deep sand slog along the road or b) add this 2 mile stretch to the beginning of the trip rather than at the end. Either choice would be better than what we ended up doing. The bathroom situation in this area is abysmal. More specifically, if you need to use one along the Hole In the Rock Road on your 35-mile drive to the trailhead, there is only 1 option, at Devil’s Garden 12 miles in! I was frustrated by this as we tried to navigate around the possible need while planning out the details for this trip. If I were to rant about it, I could not understand why a NATIONAL MOMUMENT didn’t have another vault toilet or two at key points along this road for people who recreate here. That kinda seemed ridiculous given its designation by the US government and BLM management. Maybe that’s why permits are free. 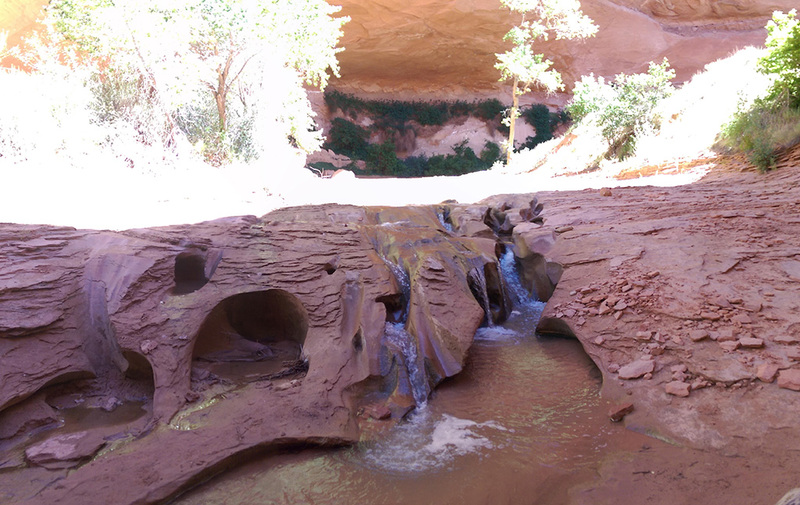 That said, all waste, including human waste (#2), must be carried out of Coyote Gulch! 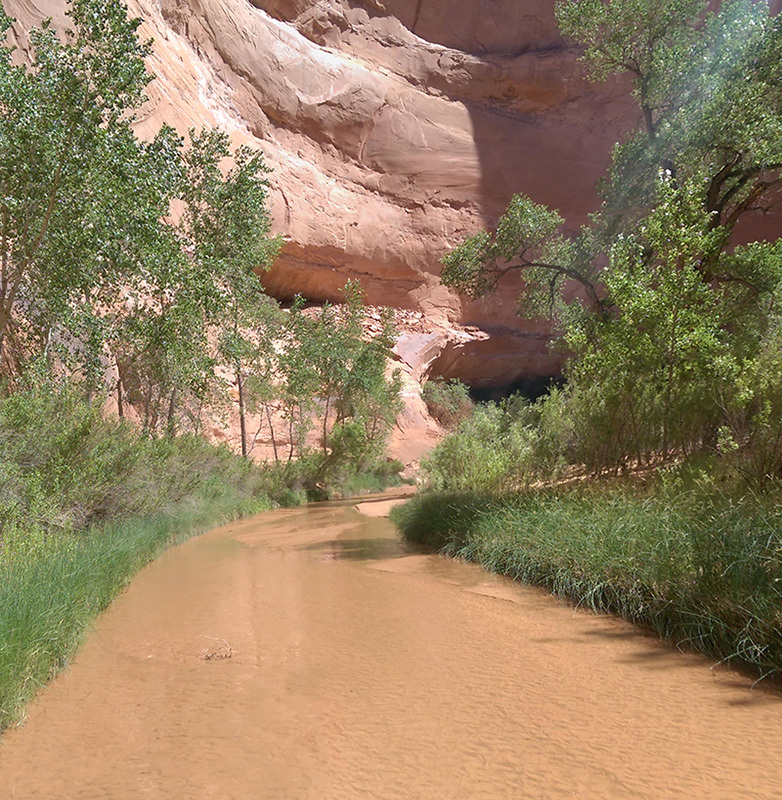 DO NOT do your business and bury it in the sand anywhere in that canyon – it would be *disgusting* to walk through the sight or smell of CRAP. I’m going to repeat that point to maintain the pleasant experience that the gulch currently offers – dump your load in a WAG bag! WAG bags are free from the Escalante Visitor’s Center – we picked up a few on the way into town just in case (but didn’t need to use them). Yeah, yeah, I heard about the toilet down in the gulch that was burned by scouts. I don’t know anything else about it but definitely disappointed by another black mark for a group that is supposed to be an example for GOOD in the community. Maybe a troop in that region could rebuild it as a service project or even as an Eagle project to help restore our reputation down there. Let me know if you do this trip and what your experience was like! Is there anything you’d do different from what we did? 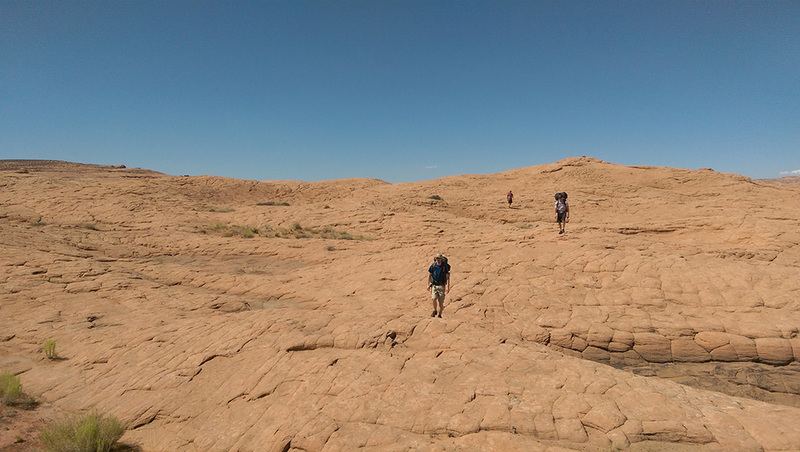 UPDATE (9/20/16): I just did this same route with a group of friends – this time as an overnight backpacking trip. We started again from the Fortymile TH, lowered our packs at the Crack and stayed in the gulch a little upstream from Black Lagoon. 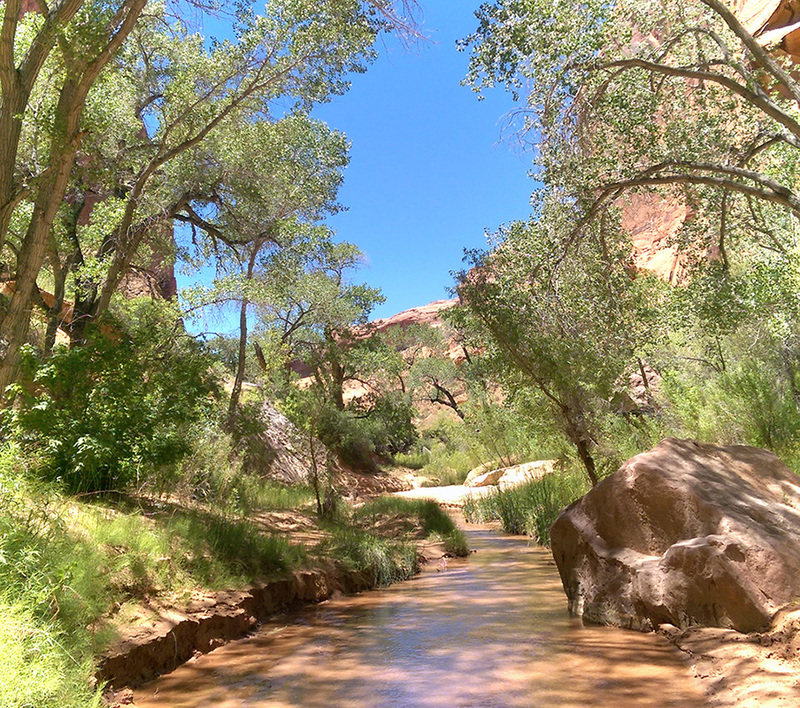 This canyon is a whole different experience when you can slow down and spend some time hanging around. 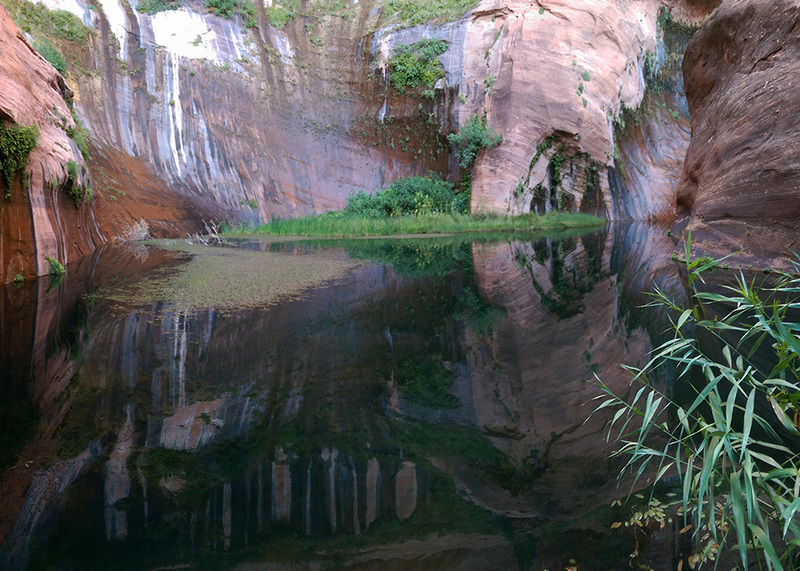 We wandered the side canyons and found ancient ruins. 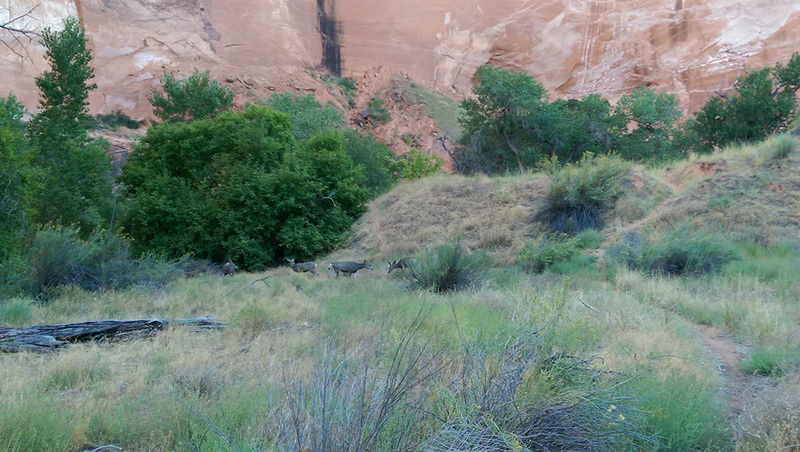 We were visited by deer (14 of them) and heard the howl of coyotes all through the night. 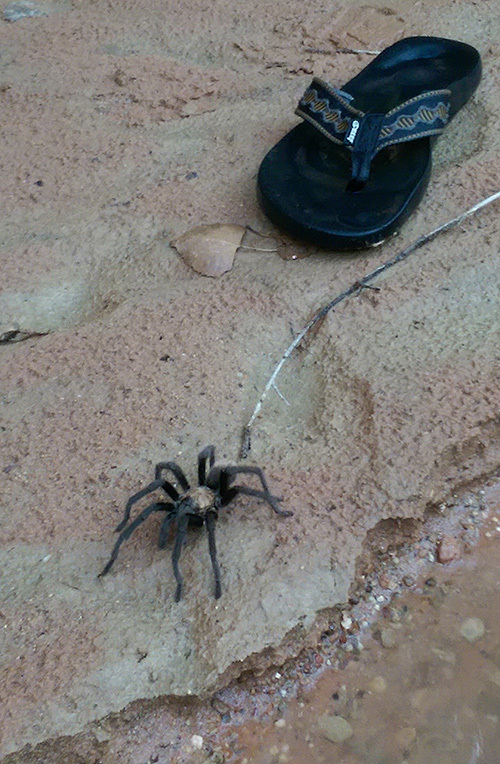 Our most exciting encounter was with a very large tarantula moseying along the shoreline as we pumped water for dinner. 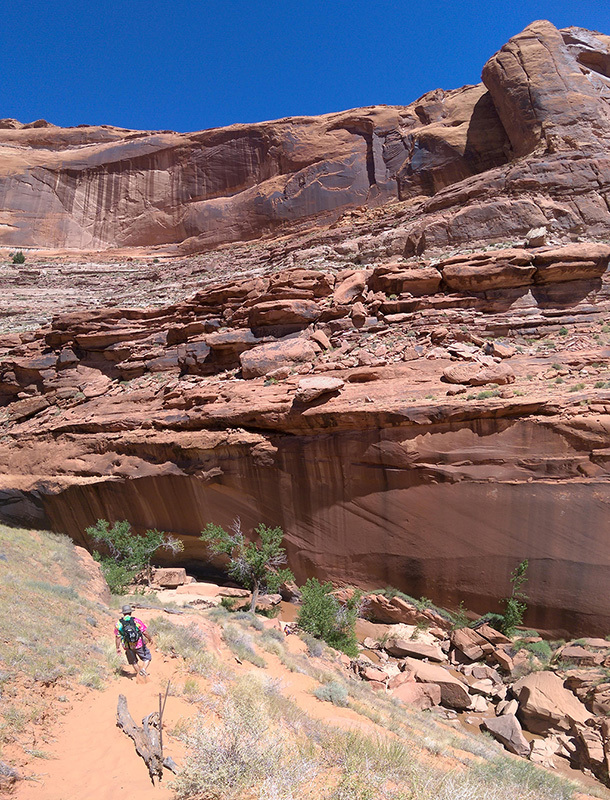 The next day we exited the gulch at Jacob Hamblin Arch and did a much better job navigating back to the truck. This time was more a game of connect-the-dots as we followed pre-marked waypoints that showed us the way out. The Google Earth file referenced here has been updated to include this better return route. We also discovered a 2nd vault toilet at Dance Hall Rock, less than a half mile from the turn-off to Fortymile Ridge. 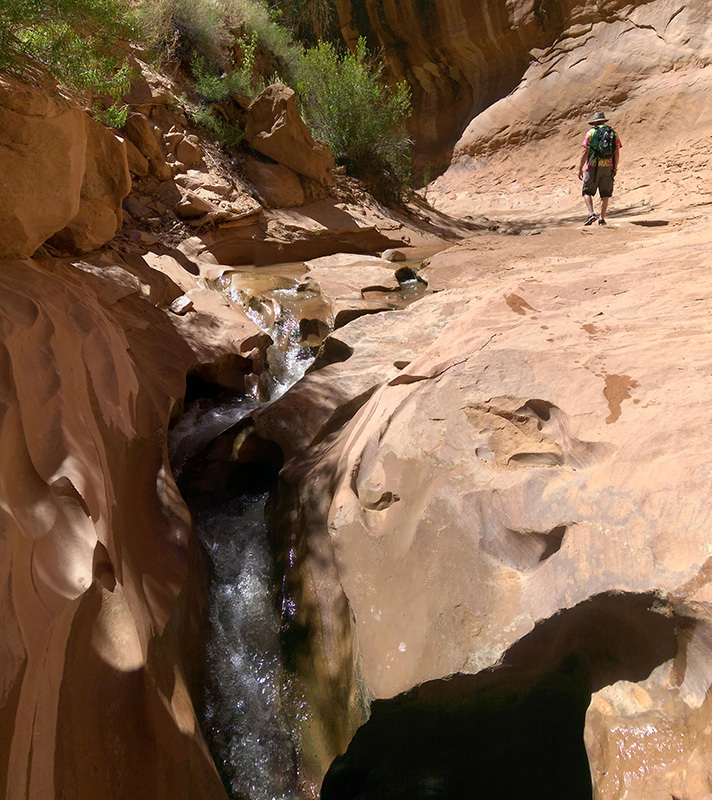 Now I want to explore entering this gulch from Hurricane or Red Well Wash! 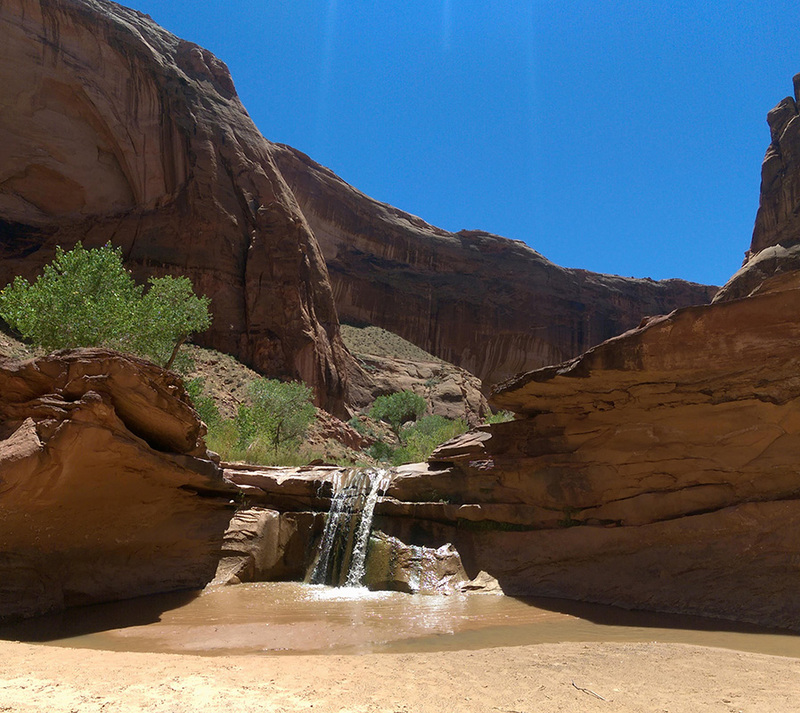 This entry was posted in Backpacking, by foot, Camping, Canyoneering, High Adventure, Hiking, Scout Outings and tagged backpacking, boy scouts, coyote gulch, escalante, high adventure, hiking merit badge, hurricane wash, red well wash, scout hike, southern utah. Bookmark the permalink. 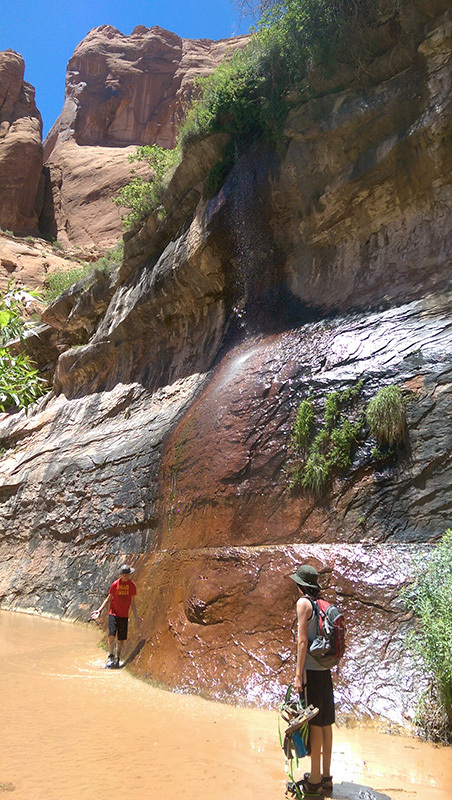 Love the post as I am looking to do this exact hike with my 9-year old over 1-2 days. We are looking to start at Forty-Mile-Ridge TH. Is the sand nervously deep on that road? Just don’t want to get stuck in a Honda Pilot. Can a 9-year old climb out of JH Arch easily? If we left our car at 40-mile ridge TH, is the hike back from JH simple and easy to find? 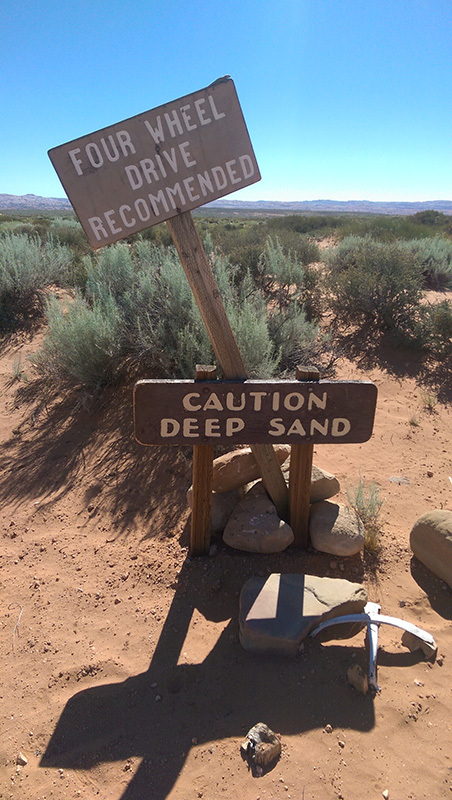 Deep sand: both times we traveled that road, it was soft but only made me nervous because of all the hype you read about online. I definitely agree that this road is not suitable for low-clearance 2WD vehicles, but I was driving a Suburban and in 4HI both times. I also knew to get some speed up and not slow down where it felt the softest. I remember a few sections where the sand was more compact as we made our way on this gradual uphill road but I’m sure that changes throughout the day/season. Maybe your comfort level can be better determined by how you feel about driving in deep snow – I kinda treated it the same. 9-year old: that’s really hard to answer… I’d say it depends on your 9-year old. Maybe it’s easier for them with a lower center of gravity? Maybe they’d scale up that wall like a mini version of Spiderman? If your kid has done other outdoor adventurous things, this might not be any big deal to them at all. Hiking back to Fourtymile: again, I think that depends on your navigational skills. 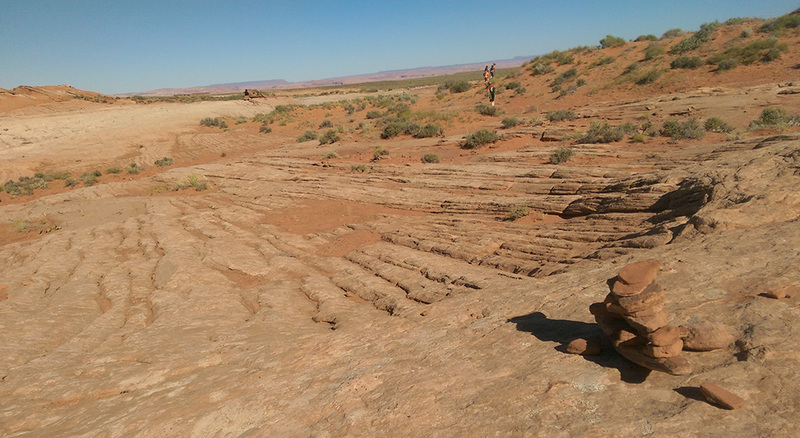 There was not a well-tracked trail across the desert rock nor did we see any consistent cairns to follow back to the car. For me, I like route-finding and was still off by more than a mile using best-guess waypoints on my GPS. My second time was more like playing connect-the-dots with much better waypoints I planned ahead of time and with other references found on the web. When I do this route again, I hope to not need any navigational help other than following visual landmarks and recognizable terrain features that are hard to describe here (but I will still have my GPS loaded with my second set of waypoints just in case). This was such an awesome post. Very informative! Apologize if this was already included, but did you camp anywhere before the hike? We’re thinking of trying to camp near the trail head. Is that possible? Thanks for the feedback! It’s always good to know people benefit from the info we share on our blog sites. To answer your question, yes, we camped for 2 nights on this outing but the spot we settled on was nowhere near this area. We later found out there are spots off the Hole-in-the-Rock road where you could camp… we just haven’t done it yet to give you any verified suggestions. 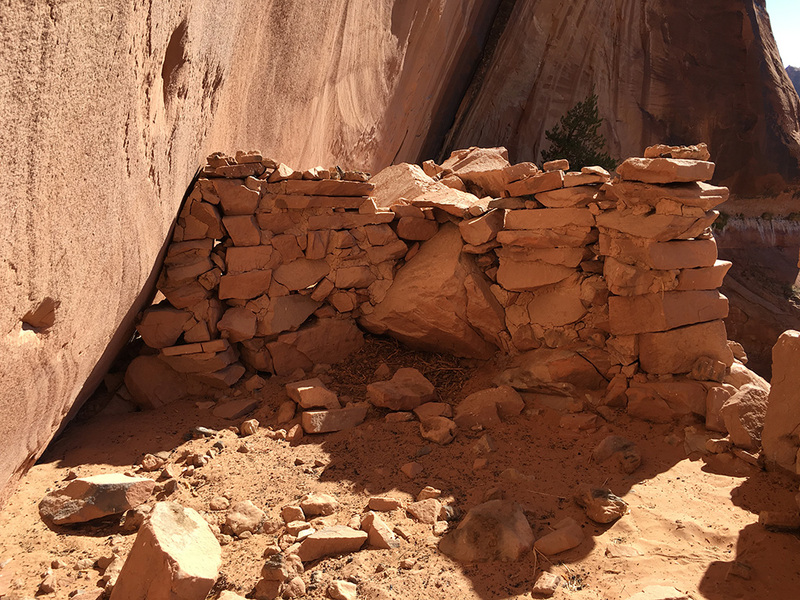 The closest option to the Jacob Hamblin or Fourtymile Ridge trailheads *might* be next to Dance Hall Rock (since a bathroom is located there too), but I’d call the Escalante Visitor’s Center to find out if there are any restrictions with camping near that historic landmark. It was definitely an awesome trip and one we will do again. To answer your question, with a fear factor considered, you could go in/out via the Crack-in-the-Wall. There still may be some height anxiety to overcome but nothing like the JH route. 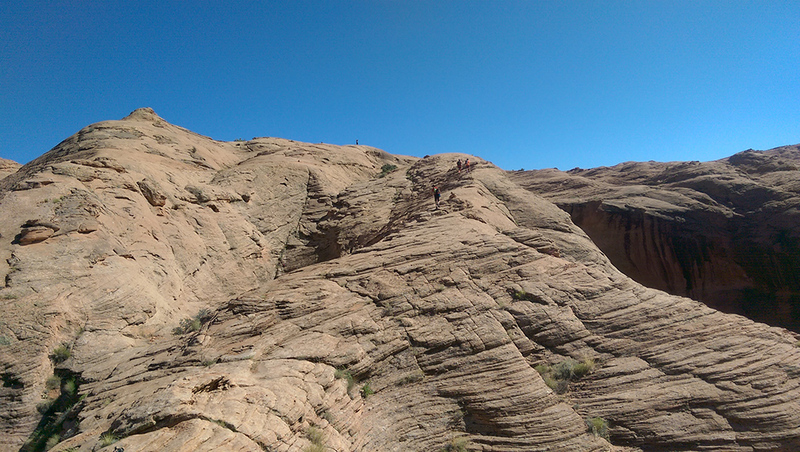 If those in your group are skinny enough, they could follow the crack all the way down. For most of my group, we had to scale the last portion along the top…but that may be a growth opportunity for those you are worried about. This YouTube clip shows what you’d be up against. 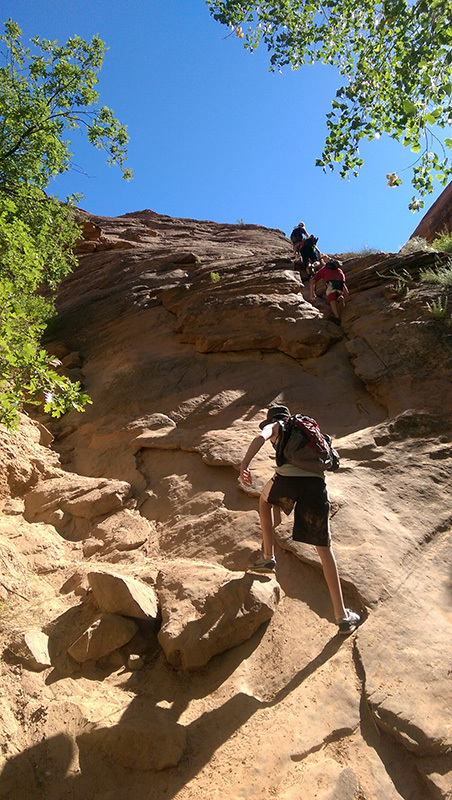 The only other downside with going back up and out the Crack is that uphill slog through deep sand while carrying a backpack. Then again, that could be another opportunity to show how hard things can be accomplished with enough effort put forth. Hope that helps! Another option for you might be to start from Hurricane Wash. I haven’t gone this way myself, but other people’s descriptions say it’s a gradual elevation change as you make your way down into the canyon. 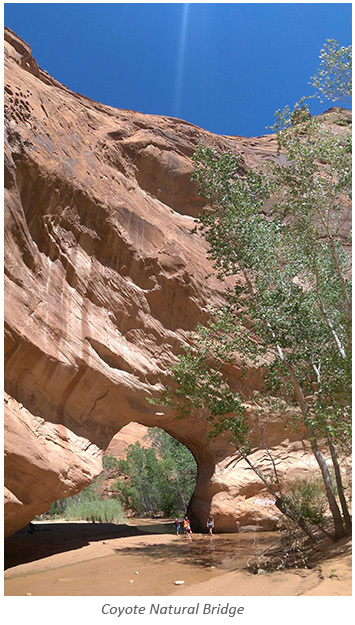 Their route details also estimate it to be about 7 miles from the Hurricane Wash Trailhead to Jacob Hamblin Arch. If (or where) you could drop packs within that first 7 miles, set up camp and explore from there is something I’d like to know too.